Perhaps you’re like me. When wildflowers are in colorful bloom, their names rise more quickly from my memory. 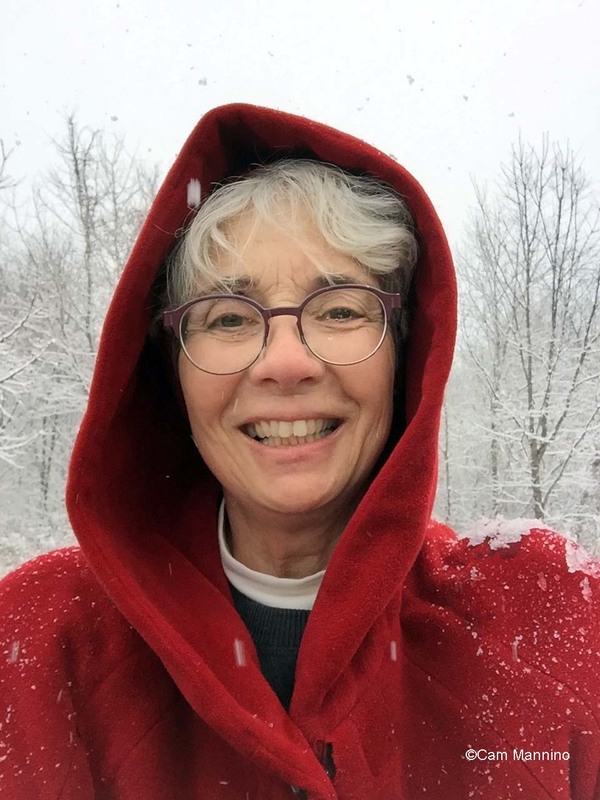 But in winter, when their graceful but desiccated architecture contrasts with winter white, I can’t always recognize, much less name, my summertime acquaintances. Wild Senna looking like yellow popcorn. It’s clear to me now why natural landscape designers encourage us to create some “visual interest” by allowing some of these plants to remain in native gardens for the winter. Ornithologists and others also remind us that dry stalks and seed heads provide food and cover for winter birds and snug homes for overwintering beneficial insects. Not surprisingly, the natural world gifts us with beauty and practical benefits in all the seasons of the year! 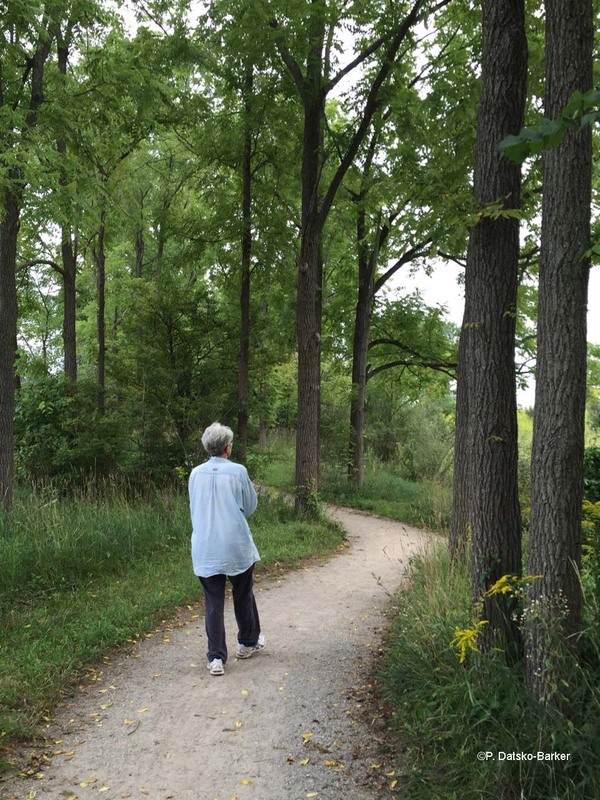 Bear Creek Nature Park: Young Birds, a Tiny Forager in Disguise and So Many Wildflowers! 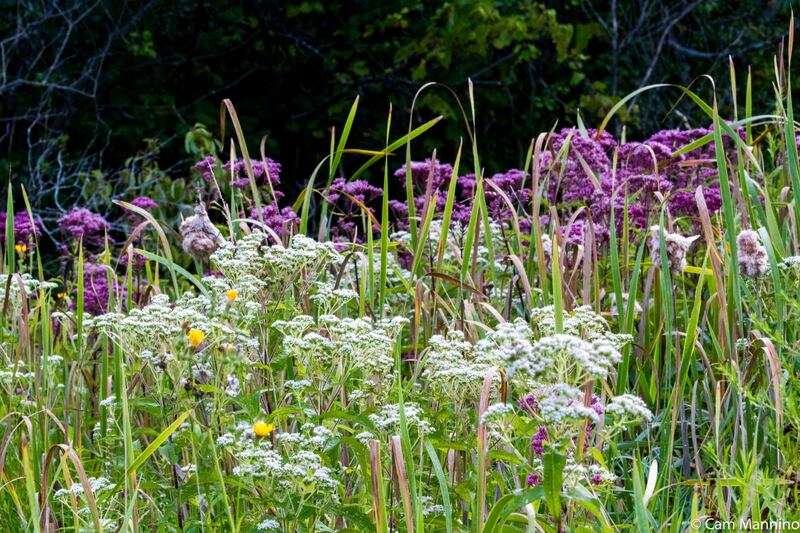 Late summer wildflowers nodded and swayed in the meadows, woods, wetlands and native gardens at Bear Creek this August. Monarch butterflies paused on the blossoms, competing mostly with industrious native bumblebees. And all over the park, young birds were feeding on their own – or in a few cases, still getting fed by doting adults. In the center pond, a tiny creature foraged in disguise! 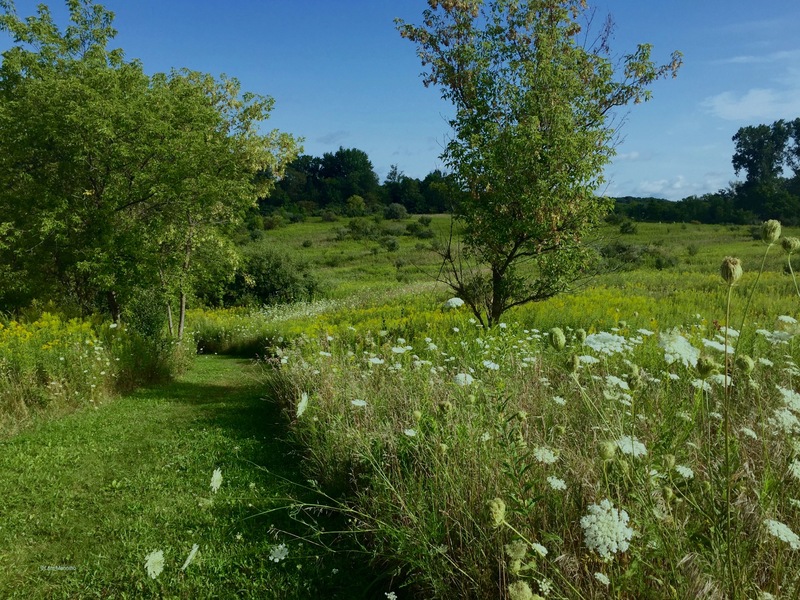 So take a wander along the trails, as goldenrod transforms the park from green to gold, and enjoy the bright beauty of summer’s last hurrah! 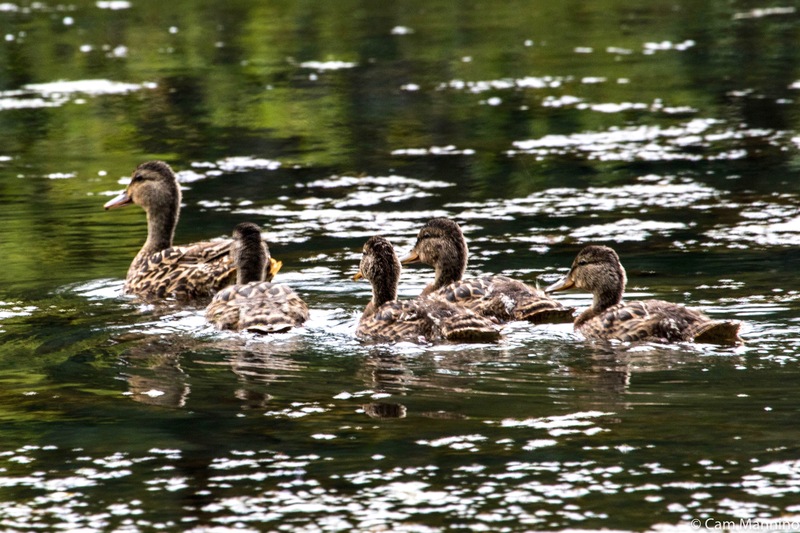 Two groups of Mallards (Anas platyrhynchos) were escorting their young around the Center Pond. In one group, two males and a female floated along with a small juvenile. The males are now in their late summer “eclipse plumage” which makes them look very much like the females – except that the males have yellow bills, while females’ bills are orange and black. The males will change back to their glamorous, iridescent green head feathers later in the fall when Mallards choose their mates for next spring. I guess these two males on the right were sticking close to this female just in case she made an early decision! 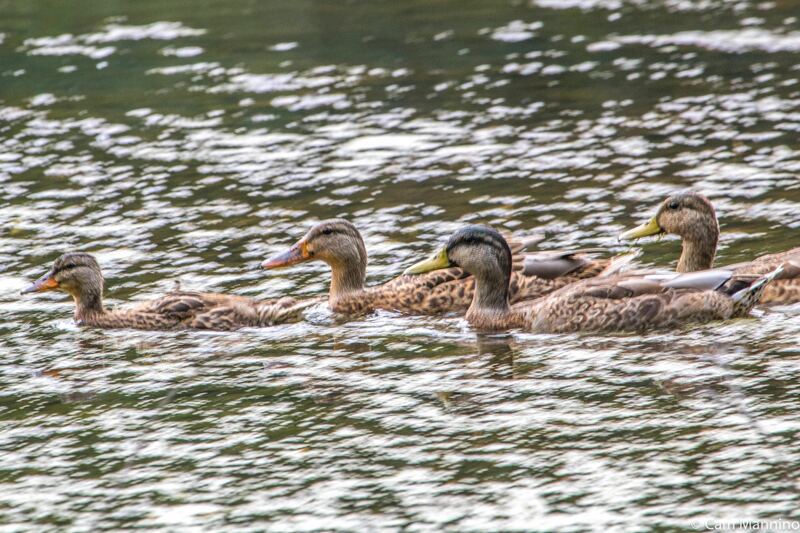 Nearby, a female Mallard escorted her four youngsters with no male attention at all. A male Northern Cardinal (Cardinalis cardinalis) seemed remarkably calm at my approach as he concentrated on gathering seeds in his beak. Usually they dash off at the first sight of me when they’re on the ground. He wasn’t crushing the seeds, so I assume he had a nest nearby since cardinals can have up to four broods in a season. That’s a lot of parenting in just a few months. 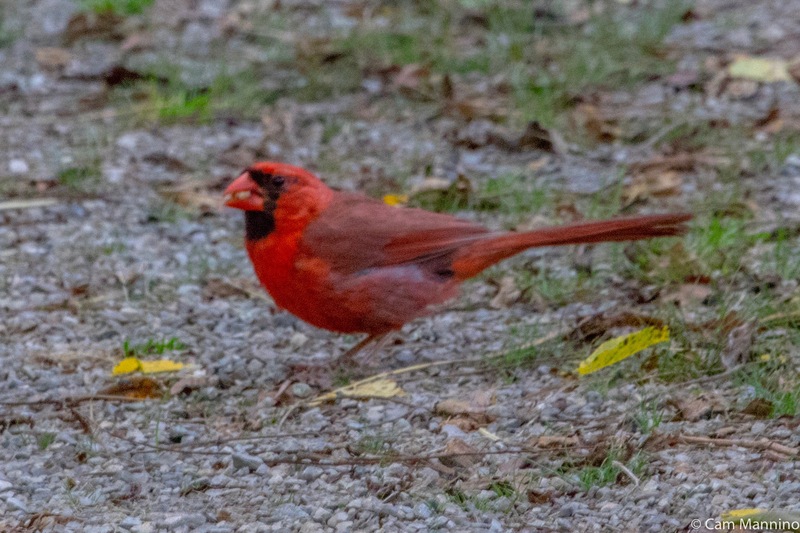 A male cardinal who seemed to be gathering seeds to take to his young rather than eating them right away. 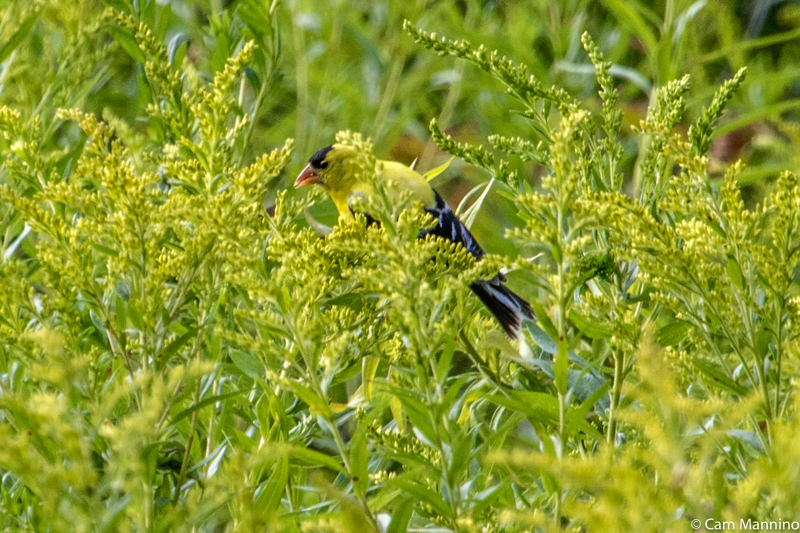 A male American Goldfinch (Spinus tristis) plucked buds from native Canada Goldenrod (Solidago canadensis) which is just beginning to bloom. He may have been feeding his young as well, since this is the nesting season for goldfinches. An American Goldfinch plucking buds from Canada Goldenrod, perhaps feeding nearby nestlings since they breed in mid-to late summer. Many bird species molt from mid-August until mid-September, including Field Sparrows, Downy Woodpeckers, House Wrens and many others. The Eastern Kingbird, featured feeding its young above, doesn’t molt until it reaches its winter territory in South America. It’s occurred to me that since birds go into hiding during the molt, perhaps their young have to be a bit more independent sooner than other birds. Just a guess. In any case, a lot of young birds are out and about, clumsily trying to forage on their own. What appears to be an adult Song Sparrow beginning its molt. Below on the path, a young Song Sparrow foraged on its own. Downy Woodpecker adults (Picoides pubescens) are molting now too. The Stokes Guide to Bird Behavior (Vol II) says “[Downy] Fledglings in general can be told from adults by the clearly new, white feathers on their breast. Adult have gone in and out of the nest hole hundreds of times by this stage and look very worn, with bits of black showing through their white breast feathers.” The feathers on the young female I saw looked wonderfully fresh as it tried to drill into a branch, so I’m guessing it’s a foraging juvenile. A young Downy with a fresh bright breast lands on a tree to look for food. After a few hops, the youngster starts drilling beneath the bark. 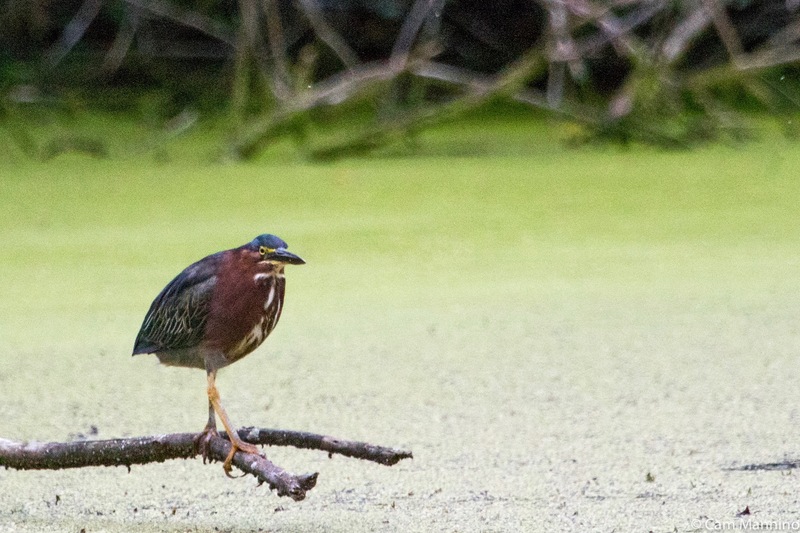 Down at the Center Pond, a Green Heron rested calmly on a log. Since spring, I’ve repeatedly seen a Green Heron in that very place, so I’m thinking it’s a mature bird. 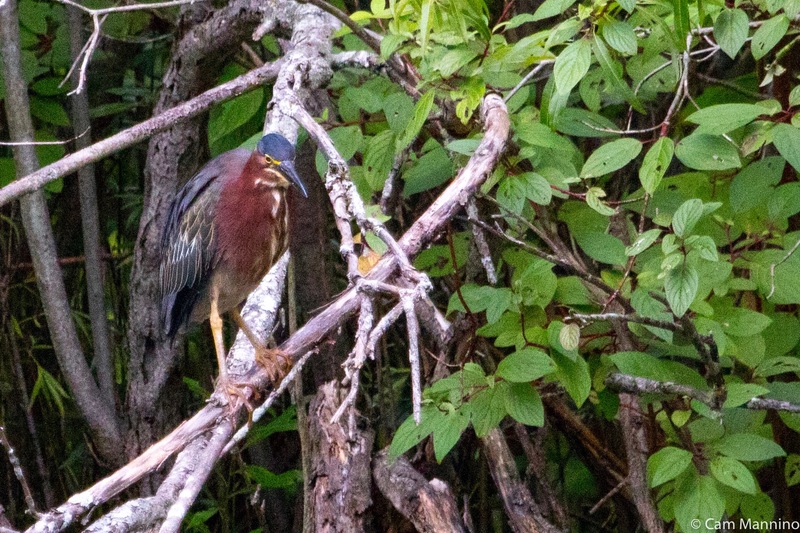 Cornell contends that Green Herons are sometimes found in colonies. But I’ve never seen more than one of these solitary birds at a time. The same heron flew up onto a bare limb, staring into the water. Two other solitary birds could have been adults or juveniles. It’s hard to distinguish with the House Wren and the Black-capped Chickadee once they’re out on their own. The House Wren may have been a youngster since it was clearly curious, but the Chickadee appeared to be a sophisticated contortionist as it probed a stick for insects. A curious House Wren seems to be listening to something I can’t hear. 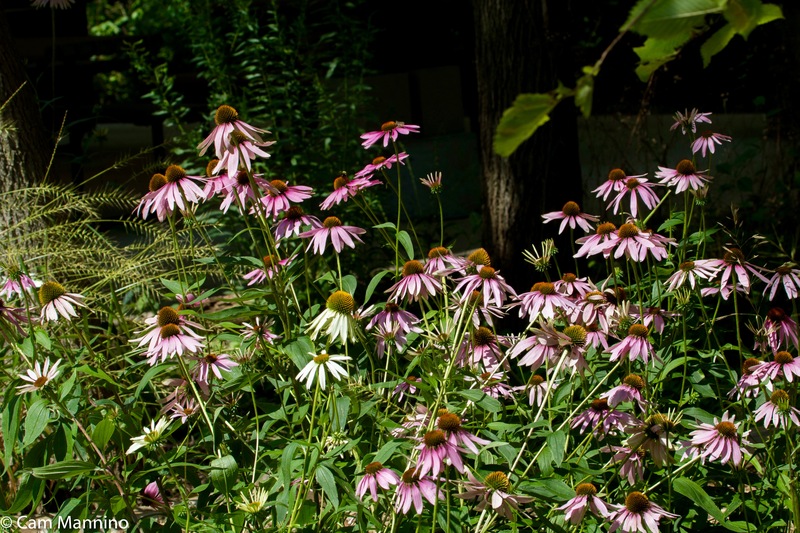 Though wildflowers are not generally as numerous on the shady paths of Bear Creek, you don’t want to miss them. So keep an eye out for their exotic shapes and vivid colors shining out of the greenery as you make your way, especially near wetlands. I just learned from Wikipedia that the Jack-o’lantern mushrooms (Omphalotus olearius) below are even bio-luminescent and their gills glow faintly green in the dark when they’re fresh! Hence the name, eh? 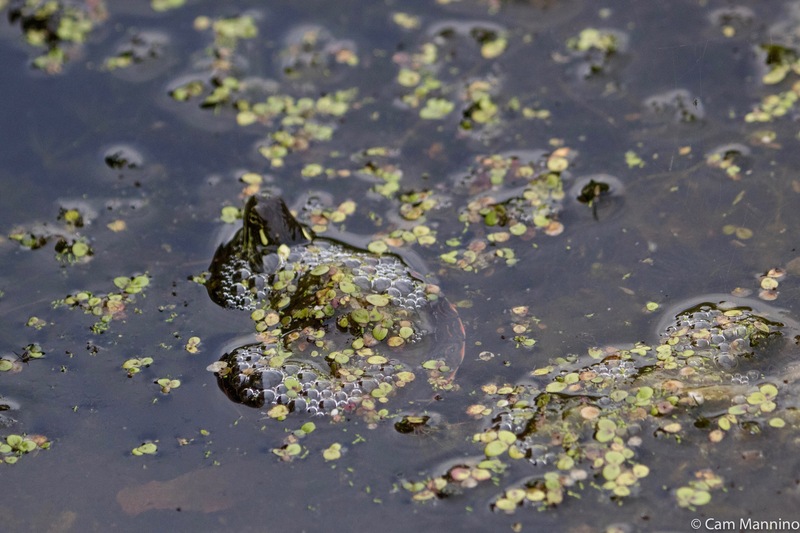 One cloudy afternoon, my husband spotted a very small clump of bubbles, green Water Meal (Wolffia coumbiana) and Duckweed (Lemna minor) moving slowly around the water of the center pond near the dock. A moving patch of Water Meal, Duckweed and bubbles on the Center Pond caught our eye. 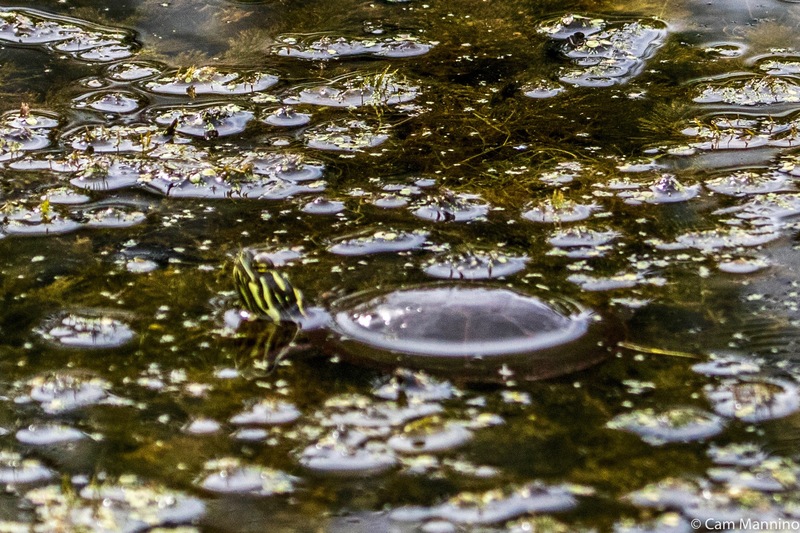 At first only the yellow/green striped head of a tiny Painted Turtle (Chrysemys picta) peeked out of the bubbly mass. The tiny head of a Painted Turtle emerged from the bubbly greenery floating in the pond. 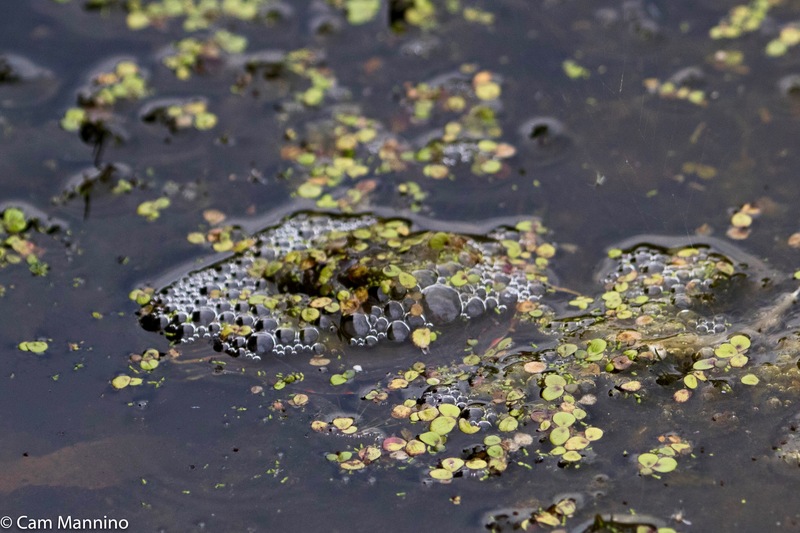 At last, we could see this tiny creature – a turtle about the size of a quarter – who’d found a nifty disguise to wear while munching on the Water Meal and Duckweed greenery that covers the pond. I’m betting on this little one to survive to adulthood! A Painted Turtle – about the size of quarter! – brings its head and shell into the sunlight. Perhaps when this baby gets a little bigger, it can join the Painted Turtles who hang out on this log at the east end of the pond almost every warm day. Last Saturday, this group seemed to be doing a slow motion version of the Hokey-Pokey (“You put your left leg in, you put your left leg out”), except for that one member who is not quite with the program! Meadows like the one shown above on the western slope are an eye-full on a summer day. The sweeps of green, yellow and white against a blue sky soothe the spirit like a cool hand on a fevered brow. Soak it in. You can feel yourself unwinding. Then look a little closer. So much of the delight in nature comes from noticing small things – like the turtle in its bubble disguise, the scarlet cardinal flower shining in a shady wetland, or a parent bird feeding its young on a leafy branch. Like any great work of art, there’s always more to see in nature’s landscapes than what comes quickly to the eye. So perhaps spend a few quiet minutes looking down into the water or into the tall grass. Scan the treetops through your binoculars. The smallest discovery can add just a little more joy to a walk in the park. Footnote: My sources for information, besides Oakland Township's Stewardship Manager Ben VanderWeide, are as follows: butterfliesathome.com;Pollinators of Native Plants by Heather Holm; Stokes Nature Guides: A Guide to Bird Behavior Volumes 1-3; Allaboutbirds.org, the website of the Cornell Ornithology Lab at Cornell University; Wikipedia; Herbarium of the University of Michigan at michiganflora.net; various Michigan Field Guides by Stan Tekiela; other sites as cited in the text.